With Garnier Skin Naturals BB Cream SPF 24 it is possible to make your skin soft, fair and flawless in an instant. Soft, silky and lightweight texture of this cream easily blends with your skin. Enriched with vitamin C, almond extracts it boosts skin glow. Reduces lines and other imperfections. Your facial skin looks clean, clear and skin tone becomes even. Nourishes your skin and leaves it soft, smooth and supple. With the help of SPF24 filters it protects your skin from harmful UV rays. Has pleasant fragrance that gives you a fresh, relaxed feel. Additional Information: A brand under cosmetic giant L?Oreal, Garnier is a mass-market cosmetics brand that has a variety of skin and hair care products under its name. 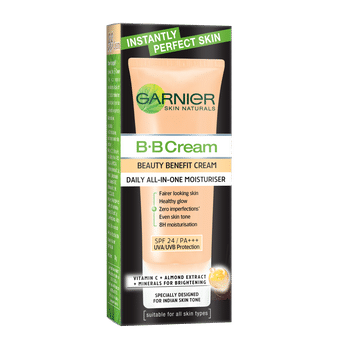 Garnier Skin Naturals BB Cream SPF 24 a must have for glowing, clean skin. Explore the entire range of Face Moisturizer & Day Cream available on Nykaa. Shop more Garnier products here.You can browse through the complete world of Garnier Face Moisturizer & Day Cream .Alternatively, you can also find many more products from the Garnier Skin Naturals BB Cream SPF 24/PA+++ range.